PLAYING WITH SUGAR: WTH??? - Where The Heck have I been????? WTH??? - Where The Heck have I been????? Seriously my dear readers, I can NOT believe it has been this long since I posted!!! - UGH! I miss you and baking for myself so much! I have (thankfully) had TONS of stuff going on in my life (good stuff). I have been baking cakes for others almost every weekend since my last posting AND a few other things. I hope you bear with me for just a little while longer. I have TONS of fabulous, yummy things to share with you for the fall. In the meantime I wanted to share some of what has been going on with me. 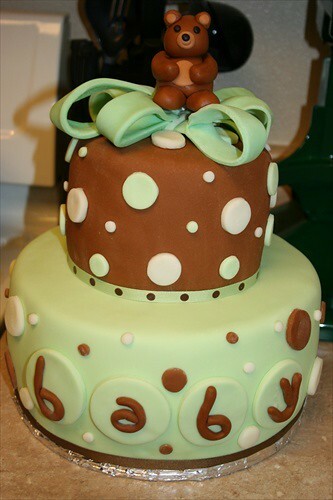 The most recent cake I made is this baby shower cake. I can't help but be in love with the teddy bear! He was almost too cute to eat! It was a two tiered cake with a 10 inch white cake and strawberry filling on the bottom topped with a 6 inch strawberry cake with butter cream frosting all of which was covered with fondant and of course this adorable little bear! 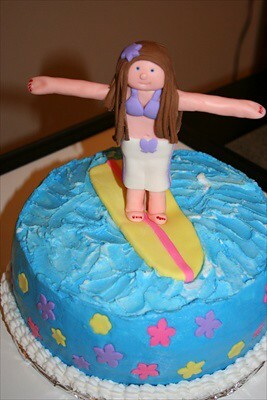 This cutie patootie surfer girl was another weekend’s project for a special 16 year olds birthday. She was made out of all fondant and the cake was a chocolate cake with strawberry filling, butter cream frosting and fondant. How cute is she??? 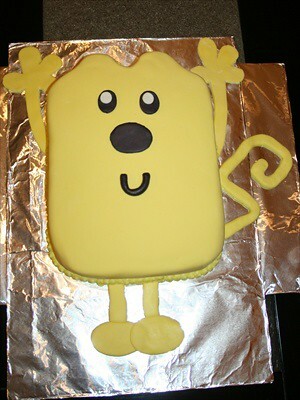 Up next was Wow Wow Wubbzy for a sweet little one year olds first birthday party. They told me that she thought it looked so much like Wubbzy that she was slightly scared to eat it! It was as single layer chocolate cake frosted with butter cream frosting and covered with fondant. 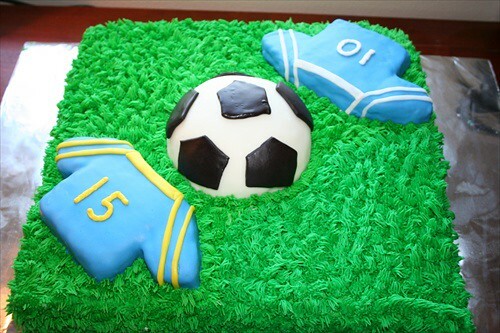 Last but not least, we have the soccer lover’s cake! This was a birthday cake for a birthday celebration shared by two little guys who love soccer. I incorporated two colors of their uniforms and of course personalized the jerseys with their individual numbers. I think they really liked it and hopefully it made a good impression with the soccer moms! It was chocolate cake with butter cream frosting. The ball and jerseys were covered in fondant. I have a fabulous wedding cake that I will be working on this weekend for a very beautiful bride and I will be sure to post pics as it will be a one of a kind! This is my 18 year old daughter Morgan. When Will got his promotion to California, Morgan decided to stay in PA to finish out her senior year. Well school is done and summer is winding down so I am proud and excited to say that Morgan is coming here to live with us!!! I have been making plans, shipping arrangements, flight arrangements, plans for going back home etc. (if anyone has any advice on shipping just clothing and shoes freight, I'd be so grateful if you'd share your knowledge and info. Thanks!) I will fly back home for a week the end of September/beginning of October to get Morgan and then after that I am all yours! Back full time and baking more than ever especially during fall which is my favorite time of the year! See you all soon! Stacy! I was actually wondering just that-where the heck you've been. And I assumed you were up to your neck in cake and fondant. I also never would have ever guess you have an 18 year old daughter! Yay for her coming home! GREAT job on all the cakes! The cakes looks delicious. I like the designs, it looks like you're having fun creating these pieces. I wish I could bake like you. Wow, you have been super busy! It ALL looks fantastic! Good luck with your daughter's move! Your cakes are beautiful! I love the surfer girl - too cute! Wow! Those cakes look amazing! That's great that you've been busy with making cake for other people! That's always fun, I'll bet. I just love your blog!!! I made the cake truffles/balls yesterday with chocolate cake and raspberry icing - so yummy! Thanks for that great idea, I know look for ways to have excess cake and icing! Also - just learned of a way to use Greyhound buses for shipping things super cheap across the country. I don't know details, but supposedly it's secure and very affordable. Good luck and happy baking! We hope to see you again. Please update, we miss your bakings! Haha! So cute, I've never worked with fondant but am going to try this week I think. You make it look super easy! oh those cakes are amazing! Beautiful blog...as your daughter is too! Your cakes look delicious and your pictures are great! Really, I hope life is grand for you! You are without a doubt a cake master. I hope to see more works from you. If you wont mind I'd love to guide Foodista readers to your post. Just add the foodista widget to the end of this post so it will appear in the Foodista pages and it's all set, Thanks!